Not available for accounts opened after 23:59:59 on 03/04/19. Eligible customers only. £125* max total refund for bets on Win & E/W Fixed Odds, Enhanced Place & Each Way Extra markets from 04/04/19 to 11:59:59 on 06/04/19. Bet restrictions & T&Cs apply. Offer Duration - This offer is available from Thursday 4th April 2019 until 11:59:59 UK Time on Saturday 6th April 2019. Eligible Customers - This offer is only available to eligible bet365 customers who opened their account before 23:59:59 UK Time on Wednesday 3rd April 2019. 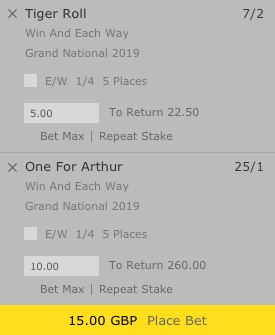 Add all of your Grand National selections to the bet slip and enter a stake for each horse. 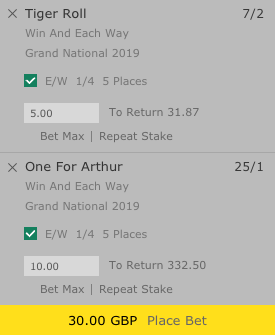 Tick the E/W box for each selection and the stakes will be doubled (stakes are doubled for Each Way bets). Place your Each Way single bets and half of the total stake will be refunded, up to a maximum total refund of £125* per customer. We will aim to credit your refund within two hours of bet placement. Bets must be placed in the usual way and can be paid for from either your Withdrawable Balance or Bet Credits. Bets placed from your Withdrawable Balance will be refunded to your Withdrawable Balance and bets placed with Bet Credits will be refunded as Bet Credits. Offer Duration - This offer is only available from 00:00:01 UK Time on Thursday 4th April 2019 until 11:59:59 UK Time on Saturday 6th April 2019. Bets placed outside of these times will not qualify. Qualifying Markets - This offer applies to Each Way single bets placed on the Win and Each Way Fixed Odds (5 Place) market, Enhanced Place Terms (6 Place) market and Each Way Extra market for the Grand National, taking place at Aintree on Saturday 6th April 2019. Non-Runners - If a qualifying bet is placed on a selection that is later made a non-runner, this bet will be refunded in full with the offer amount regenerated and made available to place on another selection. Should the selection be made a non-runner after 11:59:59 UK Time on Saturday 6th April 2019, then the bet will be refunded but the offer cannot be reclaimed. Cash Out - Once a refund has been credited, the Cash Out feature will not be available for qualifying bets. This offer will not apply where all or part of a bet has been Cashed Out. Edit Bet - Once a refund has been credited, the Edit Bet feature will not be available for qualifying bets. This offer will not apply where a bet has been edited using our Edit Bet feature. Tote Bets - Tote bets do not count as qualifying bets and will not be refunded. Settlement - Max total refund per customer is £125*. We will aim to credit your refund within two hours of bet placement. You can see a full list of your available offers by logging in and selecting the Offers section on mobile or the Promotions section on desktop. bet365 maintains a record of customer contact in relation to eligibility for offers and this record, including the date and time of any restrictions being imposed, will be final in the event of any dispute. If you open your bet365 account after 23:59:59 UK Time on Wednesday 3rd April 2019 then this offer might still appear in your list of offers but, in accordance with term 2, you are not eligible for it. This offer is only available to eligible bet365 customers who opened their account before 23:59:59 UK Time on Wednesday 3rd April 2019. This offer applies to Each Way single bets placed on the Win and Each Way Fixed Odds (5 Place) market, Enhanced Place Terms (6 Place) market and Each Way Extra market for the Grand National, taking place at Aintree on Saturday 6th April 2019. This offer only applies to qualifying bets placed between 00:00:01 UK Time on Thursday 4th April 2019 and 11:59:59 UK Time on Saturday 6th April 2019. Bets placed outside these times will not qualify. This offer only applies to qualifying bets placed via mobile, tablet or desktop. Bets placed using our Telephone Betting service will not qualify for this offer. Once a refund has been credited, the Cash Out and Edit Bet features are not available for any qualifying bets. This offer will not apply where all or part of a bet has been Cashed Out or edited using our Edit Bet feature. If a qualifying bet is placed on a selection that is later made a non-runner, this bet will be refunded in full with the offer amount regenerated and made available to place on another selection. Should the selection be made a non-runner after 11:59:59 on Saturday 6th April 2019, then the bet will be refunded but the offer cannot be reclaimed. Where any term of the offer or promotion is breached or there is any evidence of a series of bets placed by a customer or group of customers, which due to enhanced payments, refund(s), Free Bets, risk free bets, Bet Credits or any other promotional offer results in guaranteed customer profits irrespective of the outcome, whether individually or as part of a group, bet365 may reclaim the enhanced payment, refund(s), Free Bet, risk free bet or Bet Credit element of such offers and/or void any bet funded by the Free Bet or Bet Credits. In addition, where there is evidence of such activity, bet365 may levy an administration charge on the customer up to the value of the Bet Credits, Free Bet, risk free bet, enhanced payment or refunds towards the administrative costs incurred in identifying and taking action against the activity. bet365 may reclaim any bonus amount, refund(s), Free Bets, Bet Credits or enhanced payments that have been awarded in error.